Q. I found an article on Google Scholar but when I try to read it, it asks me to pay. How can I view the article for free? First, you need to make sure that Google Scholar knows you are affiliated with OLLU, so that you won't be asked to pay for articles that the library already has access to. One way to do this is to access Google Scholar through the library's Article Databases page. If you go to this page and choose Google Scholar from the list, you will be asked to sign in to the library if you are not on campus. Once you sign in, Google Scholar will connect you to links for articles that the library owns. You can also add OLLU as your affiliated school within Google Scholar so that the search engine will connect you with links to the library's resources even if you don't login through the library website. On the Google Scholar homepage, click the tab for "Settings" at the top. 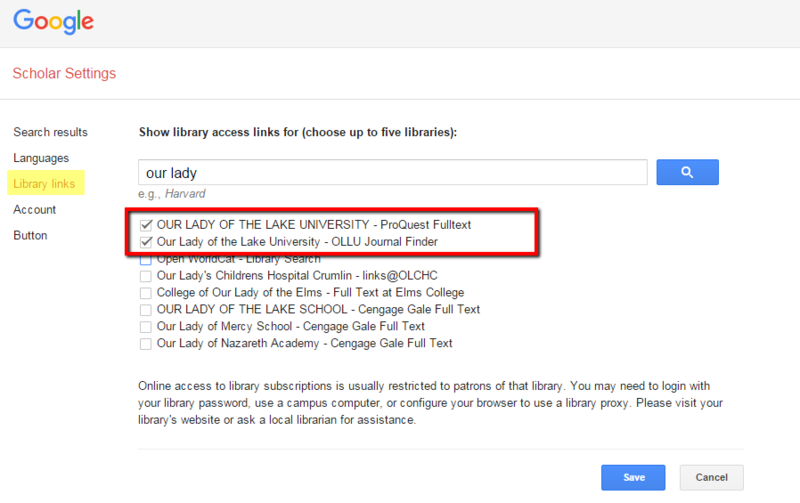 Click on "Library Links", then search for Our Lady of the Lake University and check the boxes that come up. Make sure to click "Save" when you're done. (You will still have to sign in to the library with your MyOLLU username and password to read articles that you access through Google Scholar). If you find an article that asks you to pay to access it, try searching the library's Full Text Finder to see if we have online access to that journal for free. If the library has access to the journal, narrow down the results by the year of the article and then the volume/issue to see if we have the article you need. If we don't have access to the article online, you still don't need to pay for it. You can request the article via Get It 4 Me, and we will borrow a copy from another library and email it to you. This usually takes anywhere from 3 to 10 days, so start early. If you have any questions or need additional assistance, please call us at 1-800-846-4085 or email us.